This is a great present to buy for the new Mrs!! Yes, she will love to stay here on board for the evening of your wedding, a special treat for both of you, away from your guests and having to listen to the Mediterranean Sea splashing on the sides! Included is a Jacuzzi bath, full home surround TV, Stereo sound system, large wardrobes to cater for your dress and suit, a rose, chocolates and a full bottle of Moet champagne!! Continental breakfast included and a chauffeur driven car to take you back to your accommodation or simply stay on board and be cruising the Med with our daily scheduled cruise complete with drinks, food and entertainment again! 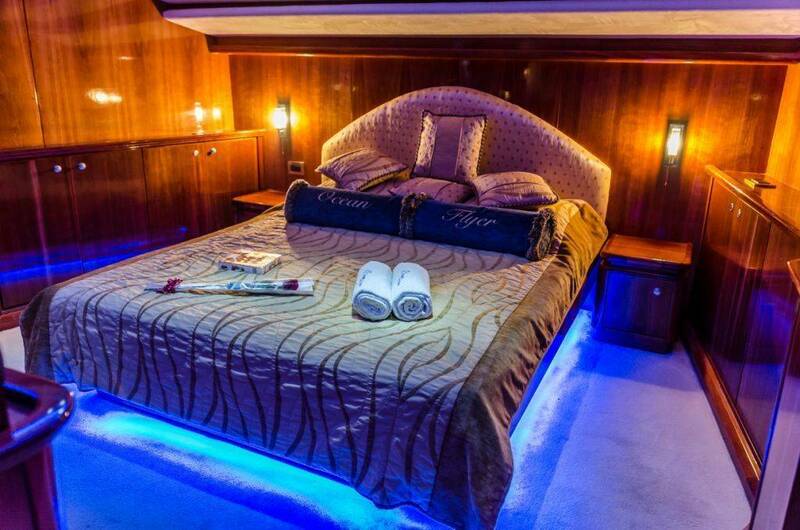 The Honeymoon Suite on board the Ocean Flyer will cost €399 for the night..... This will include a bottle of Chilled Moet and Chandon Champagne upon arrival accompanied by a box of chocolates and a Red Rose...... the symbol of True Love! The following morning you will be served with chilled Bucks Fizz and a selection of continental delicatessens ... to start your day! The suite is yours from Midnight until 10.00hrs the following morning. If the yacht is then sailing on a scheduled cruise you will of course be more than welcome to join fellow passengers on our daily scheduled Cruise with food, drinks and live entertainment on board! Please note that if you have paid the Ocean Flyer supplement then the Honeymoon Suite is included in the price.